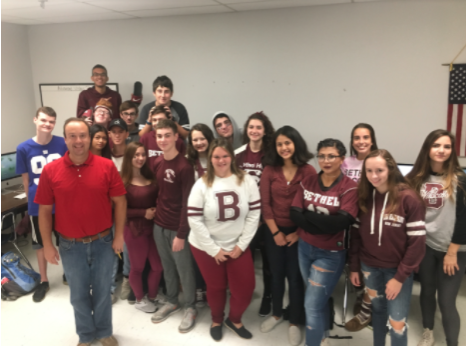 Collaboration is key and that is why Mrs. Ricciardone’s Journalism class and Mr. Ritchie’s Advanced Video Production class have joined forces this year. The combination of both classes is to allow students learn how to become better technical writers and build communication skills to gain the real life experience of what it would take to become a journalist, or land a job in the video production or broadcast journalism field. Even though the classes do not meet in the same room every day, the students feel very satisfied with the progression of the course. The classes are usually combined every other week and each time they meet they plan for another broadcast segment. Students are given the opportunity to select a newsworthy topic of their choice, write a split-screen script, interview students and staff and then shoot and edit the video footage in Adobe Premier Pro. 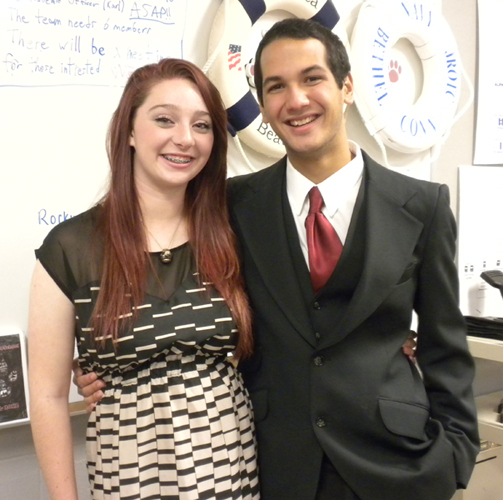 “I think we learn and understand the writing aspect in journalism class,” says Ethan Cardona ‘18. He further explains that partnering with students in the Video production class allowed him to realize the importance of knowing your audience before you write an article or script. “It’s beneficial because you learn how to write for a video segment versus print,” Cadona adds. The combination of classes also teaches students the importance of communication. Students are required to interview teachers and others students who are not in the same class, which helps them improve their communication skills and learn how to be more open to working and being around other people. Matt Scrolis ‘20, a student in Mr. Ritchie’s class, enjoys the combined experience so far. “It’s a real life experience that other students do not receive in high school,” Scrolis explains. Mrs. Ricciardone and Mr. Ritchie’s vision is that the classes becomes one joint course in the future, so students learn all aspects of journalism, videography and broadcast news. “This class gives students real-world experience and that in itself is extremely beneficial. Students learn how to effectively work with other students, they learn how to write interview questions and conduct face to face interviews, they learn how to shoot and edit footage, they realize the importance of deadlines, and in the end, they produce professional broadcast segments that they should be proud of,” says Mrs. Ricciardone. Both teachers plan to complete six projects by the end of the semester. Completed broadcast segments can be found on Twitter.